This is a guest post by Jonny Davies, Digitisation Assistant for the MRI Collections Project, funded by the Wellcome Trust Research Resources Awards. For the past few months I’ve been working with the MRI archives at the University of Nottingham which contain nearly 18500 slides produced between the 1970s and 1990s. These slides are in the collections of Sir Peter Mansfield, Brian Worthington and Raymond Andrew. Slide film, also known as ‘transparency’ or ‘reversal’ film, is perhaps most commonly associated with the domestic slideshow: families sitting through blown-up holiday snaps against the persistent whir of a carousel projector. In medical history, however, slide film played an important part in the recording and presenting of scans and the MRI slides held here in Manuscripts and Special Collections are rich records of the invention and evolution of MRI technology. For medical professionals, transparency film, which produces a ‘positive’ image had several advantages over ‘negative film’: faster processing times; higher resolution; and easily mounted to slide through a projector at lectures or conferences. Undoubtedly though, developments in digital photography have been a boon to the radiologist, particularly in terms of immediacy, and image archiving. The slide collection we hold here physically fills boxes and boxes and among them are also examples which demonstrate the fragility of film. The Wilhelm Imaging Research, estimates an archival life of 200 years for certain slide films and processes, a mere 30 for others, but poor storage and light exposure during projection can accelerate fading. Careful studying of certain of the MRI slides reveals scratches where mounts have splintered and more strikingly there are cases of uneven fading of dyes, which have left a dominant magenta or reddish colour cast. In archives, slides have, for the last decade at least, been discussed mainly in terms of obsolescence. Digitising the MRI slides therefore is essential to ensure that they can be readily and frequently accessed as a research resource. For art collections it becomes more complex. Tate gallery, in particular, quickly recognised that simply digitising slide-based artworks would lose the sensory experience of the carousel projector. As such, plans to maintain old equipment and retain knowledge of the processes involved in the duplication of slides are as much a part of the conversation as refining methods of digitisation. Against this backdrop, working with a slide collection in 2019 should feel like a nostalgic trip, and yet during the project, at the end of 2018, Kodak announced that they were reintroducing a slide film called Ektachrome. The film had first been released in the 1940s and in 2013 it joined other slide films such as Kodachrome (which Paul Simon famously sung about) in the realm of the discontinued. Ektachrome had experienced a life way beyond the family slide projector. 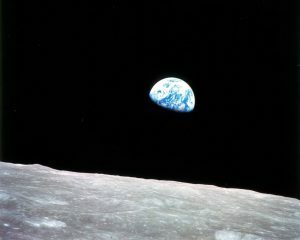 In 1968 Apollo 8, a human mission which orbited the moon, travelled with a camera loaded with a larger form of Ektachrome and captured photographs of the Earth’s sphere, including the iconic ‘Earthrise’ photograph. It was also frequently used in projected works of art, notably by Lyle Ashton Harris, and as the archives of MRI pioneers held here at Nottingham attest, for the recording of medical research and invention. 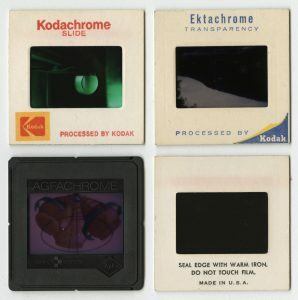 Despite its illustrious history Ektachrome finally succumbed to the convenience of digital technology: the last of Kodak’s slide films, it was a bold statement about the commercial value of reversal film. And yet 5 years further into the digital age, Kodak made a complete U-turn and reintroduced the iconic film. Whilst slide film had not entirely vanished from the shopfloor, with Fujifilm continuing to produce its own variants, Kodak’s reversal has perhaps caused a microshift in the archival landscape. It is rare that materials marked for obsolescence are re-evaluated commercially, start to feel contemporary again and can be readily bought box-fresh. 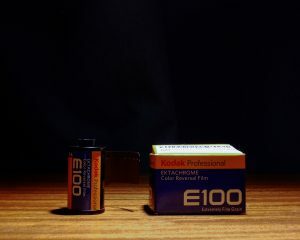 I purchased some Ektachrome recently, no bidding or checking expiry dates, just bought new, straight from the online store. I now get adverts in my social media feeds encouraging me to buy more. Although in the very early stages, it bears similarities to the revival of the phonograph record which not only boosted the second hand market but led to the manufacture of new players and bucked the trend for declining sales of physical music formats. If slides are perhaps once more in their infancy, ‘negative’ film use by photographers has come a long way in the past 5 years. As digital fatigue sets in, analogue has served as a means for photographers to stand-out in an oversaturated industry and film has broadened out from its fine art status into disciplines such as fashion photography, in spite of the medium’s imperfections. It’s not unforeseeable that the more labour intensive process of making film images will start to give way again to the instant-gratification of digital, but for now at least digital and analogue are co-existing quite harmoniously. Kodak’s U-turn and this trend for revival is good news for the MRI archives and slide collections in general. It suggests that commercially there may still be a place for slide film and subsequently the processes and knowledge that support it. The irony is that in many ways it is the modern technologies that have served to revive the older ones: digital video on YouTube explaining how old technology works and burgeoning hashtags connecting new users of old things on social media. Technology is a key force for change in our social and cultural lives but perhaps now materials in archives will start to show a reversal rather than a rupture.